John Stuart Mill was one of the 19th century’s most important philosophers and a paragon of academic devotion and moral rigor. He wrote extensively on the social issues of the day, particularly on slavery and women’s rights, and defended his own view of a just society as being one which maximizes the potential for individual development. He remains, in my humble estimation, one of the most instructive and important thinkers to ever live, his works establishing ideals that challenged – and continue to challenge – our most deeply held convictions. 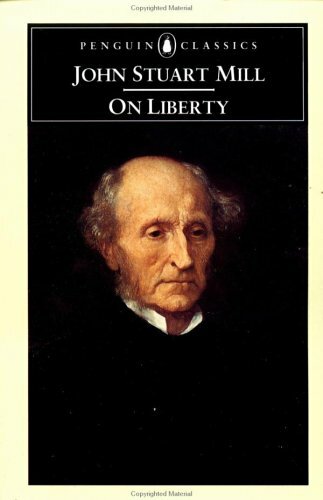 So ubiquitous is Mill’s thought that he must be fully read before his influence can be measured, and then there is little left to do except marvel that one man could be so prescient and encompass so completely the issues of liberty and freedom. I am in the habit of annotating the margins of every book I read, underlining powerful passages or arguments, but never before had the process seemed so futile as in the second chapter of Mill’s seminal On Liberty, pertaining to the importance of free speech. Every sentence is a clarion call against those who would tell you what you can and cannot read, can and cannot think, can and cannot say, guaranteeing its immortal relevance in a world so hellbent on shutting down dialogue and narrowing the field of discussion. Rather than discuss the book at length, which would strain anyone’s patience, and because I have already planned a posting on the importance of free speech that will draw heavily on Mill, I will confine myself to discussing some of the implications arising from what Mill called his “one simple principle,” which states that society can only transgress or impose on an individual to prevent harm to others, and how his voice is part of an ongoing debate pertinent to our modern life. Consider, for example, drug legalization. Where marijuana is concerned, it seems to me Mill is very clear: as it possesses no addictive properties and as it can be taken without harm to others, it cannot be justifiably prohibited. Heroine, on the other hand, possesses highly addictive properties, and while one can be said to freely choose to take heroine the first time, it develops an increasing hold on the user, gradually robbing him of free will. Should someone be allowed to exercise their freedom in a decision that will later restrict or even revoke their freedom? Mill hypothetically asks whether a man should have the right to sell himself into slavery and concludes that, the greater evil being his subsequent total lack of freedom, the state is justified in prohibiting him from abdicating his own free will. There is, however, a problem with this absolute veneration of freedom: economists have long noted that people do not act rationally with respect to the future, and choose instead to give undue weight to present happiness. This is observable in how little money is stashed away in savings accounts or retirement plans, or in how little we exercise and how much we eat, work and lose sleep, heedless to the inevitable heart attack or diabetes that any third party could have foreseen. When people are given total freedom, they often act, counterintuitively, against their own best interests. Consider the example of the recent New York City ban on the selling of soft drinks larger than 16oz. The initiative was motivated by the desire to combat growing obesity rates, especially in children, but it was (rightfully) deemed unconstitutional and revoked for reasons that borrow directly from Mill: the ban constituted an undue infringement on a person’s right to drink what they please. The difficulty of respecting liberty in the pursuit of a positive outcome is, or ought to be, every society’s chief concern, and has given rise to ingenious propositions. So-called “paternalistic libertarianism,” for example, manipulates the variables without revoking choice by making default whatever the desired outcome is but leaving open the option for dissent. So, for example, a company or government might establish a policy whereby a certain percentage of every employee’s paycheck is deposited into a retirement savings account each month by default, but give each employee the option to opt out should they so choose, thus respecting their right to decide for themselves how their money is spent while simultaneously increasing the odds that they subscribe to the program. But my greatest admiration is reserved for Mill’s thoughts on what he calls the “tyranny of opinions” or the “tyranny of the majority.” Recognizing the fallibility of the public and the individual, Mill argues that the best society is one in which ideas are freely interchanged and dismissed or adopted on their own merits, and that nothing should be so sacred as to be beyond debate or criticism. Looked at through this lens, human progress appears to me little more than the history of received wisdom and dogma combatting the encroachments of new learning until what was once sacred and taken for granted finally capitulates in favor of a new truth, or partial truth, which in time makes a similar ascent into the sacred and must one day submit to new challenges. Ultimately, what Mill offers is not a utopian fantasy but a blueprint, a middle path between the annihilating powers of fascism and the self-annihilating powers of communism, one that anticipates the failings of the 20th century even as it suggests the solution: a foundational respect for the individual. For my part, I would not trust any politician or activist who did not share this basic assumption.